Below you will find some of the questions that we most frequently are asked at Studio 2 Pilates. You can see the answer to each by clicking on the question text. If you haven’t found the answer to a question you have, please feel free to contact us directly or alternatively ask a question using the comment form below. If we think your question will be useful to other people, we’ll add it to this page. A great place to start is with a free introductory class. You can do this in a group class or individually with one of our instructors depending on your preferences. If you’re brand new to Pilates or uncertain about your abilities, an individual introductory class might make more sense but we can discuss what would be best for you when you get in touch. After your first class, you can decide to take individual classes, semi-private or group classes. We have groups of all levels of experience so whether you’re a beginner or very advanced, we should be able to find a group you’ll be comfortable and challenged in. If you would prefer to work one on one with an instructor, you can do this for as long as you like. Some of our clients even combine individual and group classes in their weekly schedules. 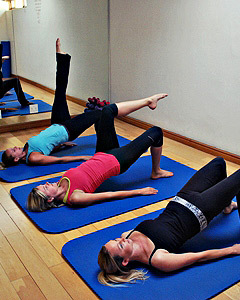 Please visit our Pilates classes page for a summary of the types of classes available. With any form of fitness, any is better than none at all. If you’re hesitating because you don’t think you can fit multiple sessions in, even once a week is a great place to start. Having said that, the ideal would be two to three times per week. As with any form of exercise, consistency is key, and it is helpful to minimise the time between classes to help remember the previous lesson and get the body familiar with a new way of moving. Have a look at our article on how often one should do Pilates for more information. Can I see your class schedule? Please have a look at our Studio 2 Pilates class schedule to see when we run our classes. Please note that we cannot guarantee availability in all classes. As a general guideline, group classes usually take place in the evenings and mornings in the week and the mornings on Saturdays. Most other times are open for individual classes though we also offer discounted off-peak group classes from 1pm to 4pm, Monday to Friday. If you are interested in discussing available times for group or individual classes, please don’t hesitate to contact us. Do I need to be fit or flexible to start Pilates? The short answer to this question is simply “no”. We have clients who join us at all levels of fitness and experience and also at all ages. Our job as Pilates instructors is to tailor a program to your body and requirements, not to make you meet any pre-defined level of fitness. We will start wherever you happen to be and the one thing that we can promise you is that with consistent attendance, you will see your body improve. Pilates and yoga come from very different places. Pilates is the creation of a German student of anatomy just a few decades ago whereas yoga is an ancient Indian practice that has been around for centuries. Despite their different origins, Pilates and yoga do share some important qualities though. Both Pilates and yoga are considered mind-body disciplines emphasizing deep breathing and concentration. They both focus on achieving what some might call “effortless effort” rather than exerting brute strength. They also both involve smooth, long movements that encourage your muscles to relax and become more supple. Good posture and a healthy back are among the key benefits that both can offer you. In terms of what you will actually do in a class, yoga focuses more on moving from one static position to another without multiple repetitions. Pilates, on the other hand, flows through a series of movements that are more dynamic and often involve performing a movement several times in order to target a set of muscles. It’s also worth mentioning that yoga has a strong connection with spirituality and meditation whereas Pilates is more focused on the physical body, having originally been created as rehabilitation methodology. If your focus is purely on improving your strength, posture, flexibility and balance, then Pilates is probably for you. If you’re searching for something that will devote more attention to your spiritual side, then yoga might be more suitable. Many people do actually practice a bit of both which is also a great option – they complement each other quite well! Pilates requires real concentration – it’s all about finding those small, deep muscles you never knew existed! While some other forms of exercise may have some of these characteristics, you’ll find that Pilates is pretty unique in how it combines them. It is a form of exercise which emphasises maximum grace with minimum effort. Can I learn how to do Pilates from a video? In this day and age, we are very lucky to have incredible resources at our disposal. You can find instructional videos from some of the best Pilates and other fitness instructors online pretty easily. These tools are great and it would be wrong to say that they have no place in your Pilates practice. However, watching someone else demonstrating exercise will not offer all the benefits of having a qualified professional watch and correct your movements. Particularly when you are getting started, accurately mimicking what you see on a video is quite challenging. When you are in a Pilates class, a good instructor will be constantly observing and correcting your movements and posture. For this reason, we do believe that visiting a studio and working with an instructor in person is important to lay a foundation. The less experience you have, the more you need to establish this strong foundation. However, that doesn’t mean that you cannot supplement what you do in the Pilates Studio with additional exercise at home, guided by a video. Because Pilates is a low-impact form of exercise, it is quite safe to do at any body weight. In fact, Pilates is a wonderful discipline for those who are starting, or have already started, a weight loss program. You will learn to activate useful muscles and move your body safely utilizing your core. This will help prepare you to engage in other activities and further support your weight loss. Our studio provides a warm and accepting environment and your instructor will make sure that you are doing exercise that is suited to your body. Whether you decide to take individual classes or join a small group (never more than 5-6 ladies), we hope you will find the environment much more pleasant than that of a typical gym. If you are overweight, engaging in any new physical activity will likely result in weight loss. Many of our clients have succeeded in losing un-wanted weight while attending our studio. However, it’s important to note that weight loss is affected by many factors including diet and your lifestyle outside of the Studio. It’s also important to understand that Pilates is not a discipline that was created with weight loss in mind. Pilates focuses more on strengthening your body in a way that will support overall well-being and allow you to be more active. In this way, Pilates can lay the foundation for additional efforts to lose weight if they are required. If you’re generally interested in weight loss, you might be interested in reading some of our articles on fat loss. You should always consult your physician before starting any fitness routine. However, Pilates is a discipline designed with back rehabilitation in mind. Many people significantly alleviate back and other pain through a consistent Pilates practice. It is very important that you communicate clearly with your instructor about any diagnosed conditions and pain experienced both inside and outside the Studio. Based on this information, she will be able to modify the exercises to accommodate your limitations and, in many cases, address the underlying issues. If you have back or any other issues, please feel free to get in touch to discuss how Pilates might work for you. Is it safe to do Pilates while I’m pregnant? Pilates is a form of exercise well-suited to pregnancy and we have been lucky to see many clients through their 9 months at Studio 2 Pilates. During a normal, healthy pregnancy, moderate exercise like Pilates is considered to be safe for the foetus. In fact, regular exercise can help to prevent varicose veins, haemorrhoids and lower back pain and prepare the body for the physical demands of motherhood. We structure programs for our pregnant clients with these goals in mind. A woman’s body goes through many changes during pregnancy and so we adapt and modify the routine as pregnancy progresses. During your first trimester, we may have to adjust your class around fatigue levels. Later on, we reduce the demand on your abdominal muscles and also avoid doing exercises on your back because of the pressure of the foetus’s weight. We also do lots of work to support your joints which will be taking strain from the weight and also becoming looser due to hormonal changes. Our pregnant clients tend to take individual classes or team up with other ladies who are also expecting. Because exercises must be modified to suit a pregnant body, we don’t recommend joining a regular group class. If you’d like to read a bit more about what exercise you can do during pregnancy, have a look at our article: Pregnancy Exercise – What should you be focusing on? We also have a section of our blog devoted to Pregnancy and Pilates where we cover specific exercises and also have been tracking the progress of one of our pregnant clients. Pilates is a great exercise discipline for seniors. Joseph Pilates himself practiced his method into his eighties. At Studio 2 Pilates, we have been lucky enough to work with several clients who have demonstrated that you can stay active well into your later years! One of the great things about Pilates is the way that it can be modified to suit almost any body. 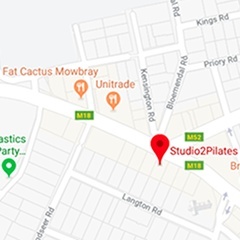 By keeping our classes small and intimate at Studio2Pilates, we ensure that we can really tailor a program to our clients’ requirements whatever they may be. It’s also worth noting that many of the benefits of Pilates will actually directly combat the effects of ageing. For instance, Pilates help to support posture and alleviate joint pain which can become issues later in life. For more information about the benefits of Pilates, have a look at our About Pilates page. Dress comfortably so that your movement is free, but keep in mind it is important that the instructor is able to observe your body as you move. You will not need trainers but all clients are required to wear socks for hygiene purposes. At Studio 2 Pilates, we understand that sometimes you may have to miss your scheduled class. As such, if you let us know by 15:00 the day before your class, we will provide you with an opportunity to do a make-up class. If a make-up class is missed or cancelled, the class may not be rescheduled and as a result, will be forfeited. As is common practice at fitness studios, when you cancel a class after the cut off time, (15:00 the day before), we unfortunately cannot offer a make-up or credit. This is to ensure that we have time to adequately plan to accommodate all of our clients. We always welcome any qualified instructors to get in touch with us to discuss different job opportunities available at Studio2Pilates. Read through our Instructor Job Page for more information.